You have to love a nice, juicy burger that’s loaded with yummy toppings. Today I have a secret recipe for Texas Roadhouse’s beef burger. This hearty burger is served on an onion roll with Swiss cheese, crispy bacon, caramelized onions, crispy onion ring and a tasty garlic mayonnaise. In a small bowl whisk together mayonnaise, garlic, lemon juice and 1 teaspoon of olive oil. Season with salt and pepper. Cover and chill until needed. Heat oil in a deep fryer to 375 degrees. Add onion rings and fry in oil until golden brown. Drain on paper towels. Set aside. Heat oil in a large skillet over medium heat. Add the onions to the pan. Cook the onions, covered, over medium heat for 30 minutes or until the onions begin to turn golden brown and caramelize. Be careful not burn them. Remove the lid and cook for 5 minutes more and add ½ cup of water. Allow the water to evaporate. Set aside. Add slices of the bacon to a cold frying pan and turn the heat to medium low. While the bacon is cooking, frequently turn it over so that it cooks evenly on both sides. Cook until the bacon has reached a deep brown color, about 10-15 minutes. Drain on paper towels. Make 4 patties out of the ground beef and season the patties on both sides with salt and pepper. Lightly grease the grates of an outdoor grill. Heat the grill to medium-high heat. Add the burger patties on cook turning at least once until the hamburgers are fully cooked (the internal temperature has reached 160 degrees F.). During the last few minutes of cooking top each patty with a slice of cheese and cook until melted. Split the hamburger buns in half and place them cut-side down onto the grill. Cook until lightly toasted on the bottom. Remove from the grill. Spread a thin layer of the garlic mayonnaise onto the top of the bottom of half each bun. Top with some caramelized onions, a burger patty, 2 slices of bacon, and 1 onion ring. Spread a thin layer of the garlic mayonnaise onto the bottom of the top half of each bun. Place onto the burger, garlic-mayonnaise side down. Today I have a secret recipe for a delicious dish served at Texas Roadhouse. 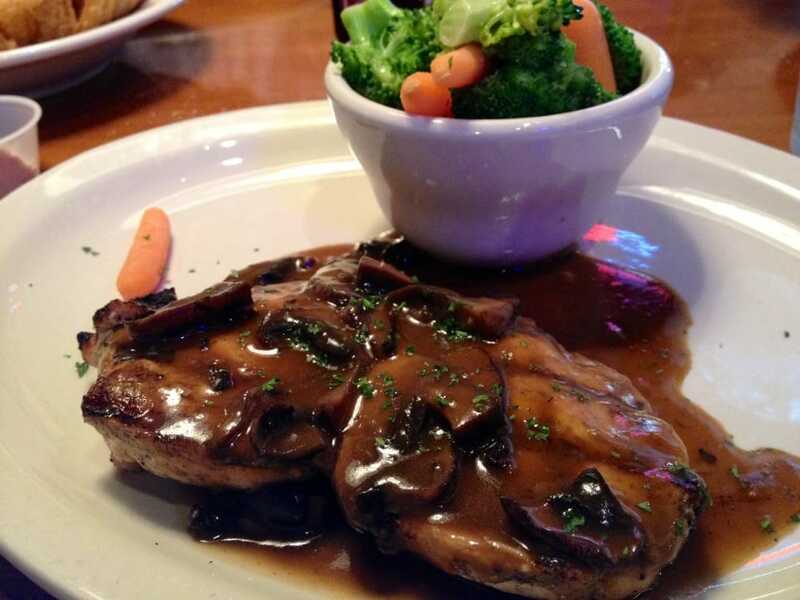 Perfectly grilled chicken breast is topped with a scratch-made portobello mushroom sauce, sauteed Portobello mushrooms, Monterey Jack and grated Parmesan cheese. Serve this dish with mashed potatoes and steamed broccoli. cheese on each piece of chicken. Heat until cheese melts. Ladle the Portobello Mushroom Sauce (see recipe here) over the chicken and cheese. Top with sauteed portobello mushrooms, grated parmesan cheese and fresh chopped parsley. Serve immediately. Today’s secret recipe (below) will show you how to prepare Texas Roadhouse’s award winning killer ribs. These amazing ribs are seasoned with a dry rub, then baked slow and low before being grilled to perfection. They are loaded with flavor and fall right off the bone. You can prepare most of this recipe ahead of time, then just bring them to your next barbecue and heat them up on the grill. Score the frozen ribs several times on the back of the rack. Rub 1/8 cup of the Texas Roadhouse rib seasoning over each side of the ribs. Use additional seasoning if needed to cover each side of the ribs. Allow to marinate in the seasoning for 24-48 hours. Preheat oven to 275 F. Place a wire rack in a large shallow pan large enough to hold the rack of ribs. Combine the water and liquid smoke in the large pan. Mix well. Place the ribs in the pan on top of the wire rack. 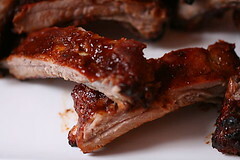 Do not allow the ribs to touch the water-liquid smoke mixture. Cover the pan tightly with aluminum foil. Bake for about five hours. Cook until the ribs nearly fall off the bone. While the ribs are cooking, saute the onion in vegetable oil in a saucepan. When the onion is soft, add the remaining ingredients and bring to a boil. Reduce heat to a simmer and simmer for an hour over low heat, until thickened. Grill covered for about four minutes on each side. Brush with BBQ sauce, then flip to allow the sauce to caramelize. Repeat with the other side. Serve. 3) Grow Delicious Tomatoes With Less Time & Less Work.